Caladiums, or Elephant Ear Plants, are grown for their large heart-shaped colorful leaves that are often more spectacular than many flowers. The most popular varieties grown are the “fancy-leaved” and “lance-leaved”. 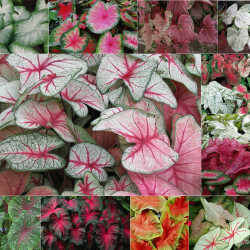 The leaves of a Caladium, some as long as 24 inches, have marbled or veined patterns of red, pink, white, and green. A Caladium is a tuberous rooted perennial that originally came from South America. It dies back and becomes dormant from late fall to early spring. The beautiful ornamental foliage makes the extra care required to grow and then re-grow a Caladium each year well worth it. This plant is poisonous so please keep it away from children and pets. LIGHTING REQUIREMENTS: A Caladium requires very bright indirect light. CARE INSTRUCTIONS WATER: The soil of a Caladium should be moist but never soggy when the plant is actively growing. As the leaves of the Caladium start to die back in the early fall and the plant goes into its resting period, gradually reduce the watering until the soil has thoroughly dried out. FERTILIZER: Fertilize a Caladium every two weeks when it is actively growing with a water-soluble plant food high in nitrogen at 1/2 the recommended strength. TEMPERATURE: A Caladium does well in temperatures between 70-85 degrees with as little fluctuation in temperature as possible. During the five months when a Caladium is dormant, the temperature should be cooler but never below 55 degrees. HUMIDITY: A Caladium needs a great deal of humidity. You can increase the humidity around the plant in various ways: keep the Caladium on a bed of wet gravel or pebbles at all time; place a small humidifier near it; or group several plants near each other to create a mini greenhouse effect. PESTS: The colorful leaves of Caladium attract mealy bug, spider mite, and Aphid infestations. Gently wash any pests off the leaves with warm soapy water. DISEASES: Caladium are prone to fungal diseases such as Fusarium and Pythium which usually result in root rot. A bacterial disease called Xanthamonas which causes leaf spot may also may infect Caladiums. Provide good air circulation and keep the leaves dry to prevent these problems. SOIL: A Caladium grows best in a slightly acidic fast-draining soil. Once a month water a Caladium with left-over tea or a very dilute vinegar water solution. A Cast Iron Plant, native to China, is an almost indestructible, easy-care plant that survives where other houseplants quickly die. Water it or forget to water it, good light or poor light, warm room or cold room, the Cast Iron Plant survives. A Cast Iron Plant is a rather plain plant with 2ft. long, pointed, course textured, leathery leaves that emerge directly from the soil. The variegated varieties of a Cast Iron Plant have a cream-colored stripe down each of the leaves that reverts to solid green in very low light. LIGHTING REQUIREMENTS: Bright light to full sun CARE INSTRUCTIONS WATER: Water thoroughly then allow top 2 in (5 cm) to dry out before watering again. Put it in a pot with drainage holes to prevent soggy soil. Cardboard palm grows the most spring through fall, so cut back on water in the winter months. HUMIDITY: Average to low humidity TEMPERATURE: Average room temperature 60-75°F/16-24°C year-round. It's cold-hardy down to 25°F/-1°C, but prefers to be warm. SOIL: Equal parts good-quality potting mix and sand for good drainage. FERTILIZER: Feed once in spring and again in summer with a time-release fertilizer. PROPAGATION: Buy good-quality seeds. Any seeds collected from a mature plant are not fertile unless they are cross-pollinated. Seeds are slow to germinate and seedlings are slow-growing. Be patient, it'll take years for them to grow tall. These seeds are poisonous and can be lethal to pets. The Cat Palm, also called the Cascade or Cataract Palm is native to Southeastern Mexico and resembles the inexpensive Areca Palm and the very pricey Kentia Palm. Indoors the plant grows slowly, eventually reaching a height of 4-6ft. Although this plant looks beautiful in the plant nursery, it often deteriorates once you bring it home. It requires a very tropical environment; bright indirect light and plenty of water. This is a very attractive plant that produces glossy, dark green leaves on thin shoots, but it is a challenging plant that needs attention. LIGHTING REQUIREMENTS: Cat Palms need bright indirect light. Very few houseplants should be placed in direct sun. High light refers only to bright indirect light since direct sun often burns the leaves of indoor houseplants. An area that is too hot and dry encourages Spider Mites and causes blooms to quickly fade. A northern exposure really doesn't provide enough light for high light plants. These plants need to be placed directly in front of an east-facing window, within 1-3 feet of a west-facing window, and within 5 ft. of a south facing window. CARE INSTRUCTIONS WATER: Cat Palms like to have moist but not soggy soil at all times. They are very unforgiving if the soil gets too dry. Salty water or water containing chemicals such as fluoride will cause leaf tip burn. FERTILIZER: Less rather than more plant food is always better with palms. Feed a Cat Palm monthly is the spring and summer with a basic houseplant food at 1/2 the recommended strength. Cat Palms only need fertilizer once or twice during winter and fall. TEMPERATURE: Palms like heat but too much dry heat causes leaf damage. Avoid placing palms in drafts, in front of heaters or air conditioners, or in unheated rooms during the winter. The ideal temperatures are 80 degrees during the day and no lower than 45 degrees at night. HUMIDITY: Lack of sufficient humidity is one of the main reasons Cat Palms do not thrive indoors. Ideally the room should have about 55% humidity, but this is rarely the case. You can place a humidifier in the room or place the palm on a wet gravel tray; just be sure the plant sits on the gravel and not in the water. PEST: Sspider mites, scale, Mealy Bugs, and ants can all be a problem. DISEASES: Helminthosporium, or leaf spot is a fungal disease that affects the leaves of a cat palm. It appears as a reddish-brown lesion between one-eighth to one-fourth inches in length. SOIL: The Cat Palm requires a potting soil that drains quickly. Try adding peat moss to your regular potting soil to keep the soil light rather than heavy and clay-like.. This is another of our "living fossil" plants, having had survived on earth since the time of the dinosaurs. 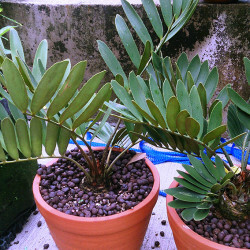 Cardboard palm belongs to the Cycad family (cycad is Greek for "palm" to which most cycads bear resemblance). Other cycads include the coontie palm and the sago palm (of course, neither of these are palms but they really do look them!). LIGHTING REQUIREMENTS: Bright light to full sun CARE INSTRUCTIONS WATER: These plants like moist soil at all times. Calla Lilies are not drought resistant and should never be allowed to totally dry out; but will not do well if the soil is too soggy or they are allowed to sit in water. FERTILIZER: Fertilize an indoor Calla Lily every two weeks when the plant is flowering with a liquid plant food low in Nitrogen. When the plant is producing only leaves and no flowers, fertilize monthly. Always dilute the plant food to ½ the recommended strength. If your Calla Lily is planted outside, use a granular plant food instead of a liquid fertilizer. TEMPERATURE: Room temperatures should be between 50-75°F, 10-24°C for optimal growth. Keep Calla Lilies away from heating and air conditioning vents. If planted outdoors, be sure to dig up the Calla Lily bulbs and bring them inside before temperatures dip below freezing. HUMIDITY: Calla Lilies do well in average humidity. FLOWERING: The flowers of a Calla Lily are really spaths similar to those of a Peace Lily but much more impressive. The plant usually blooms for about six weeks during the late spring and early summer. Keeping the plant potbound encourages more blooms. Calla Lilies may be forced into bloom at any time indoors; it all depends on when the bulbs become available and when they are planted. The long lasting cut flowers are perfect in bouquets and flower arrangements. PESTS: Examine a Calla Lily frequently for signs of scale or Aphids. DISEASES: Calla Lilies are susceptible to various viruses and bacterial infections, especially rhizome rot and gray mold. These problems become evident when leaves and stems start to turn yellow before the plant is normally entering its dormant phase. SOIL: Use a good peat moss based potting soil that is well aerated and drains quickly. You can add builder’s sand or perlite if the soil seems too heavy and clay-like. A China Doll Plant is a very fast growing plant with lacy-looking, glossy, green foliage that is native to the subtropical mountain regions of southern China and Taiwan. China Doll Plants appear very compact and sturdy when you first buy them because of the growth regulators given to them by growers. These growth regulators make normal sized leaves grow on short stems. As this regulator in the soil is used up, a China Doll Plant starts growing in all directions just like the outdoor plant it really is. Instead of a dense plant with lots of leaves, a China Doll Plant soon becomes open and feathery. A China Doll Plant, with its soft delicate leaves, makes a beautiful houseplant if placed in very bright light and frequently pinched back. LIGHTING REQUIREMENTS: A China Doll Plant requires very bright light. CARE INSTRUCTIONS WATER: China Doll Plants want to be kept on the dry side. Allow the top 50% of the soil to dry out before watering a China Doll Plant. The foliage may even turn a pale green when a China Doll Plant needs water. Water around the entire soil surface so water reaches all of the roots of the China Doll Plant. FERTILIZER: Feed a China Doll Plant monthly in the spring and summer when it is actively growing and every other month in the fall and winter with a balanced fertilizer at 1/2 the recommended strength. TEMPERATURE: A China Doll Plant does well in temperatures between 65-75 degrees. Keep China Doll Plants away from drafts and cold windowsills or the leaves fall off. HUMIDITY: China Doll Plants grow well in basic household humidity. FLOWERING: A China Doll Plant gets flowers when grown as an outdoor plant, but not when grown indoors. PESTS: Spider mites, Aphids, and Mealy Bugs are attracted to China Doll Plants. Because of the many leaves a China Doll plant has, it is difficult to get rid of houseplant pests. Check your China Doll Plant every week as a precaution. DISEASES: China Doll Plants are prone to fungal infections that can cause the houseplant disease called Leaf Spot. Providing good air circulation around a China Doll Plant and keeping the leaves dry helps prevent Leaf Spot Disease. SOIL: Use a rich well-aerated soil that drains quickly for a China Doll Plant. Add sand or perlite to loosen the soil if necessary. Ctenanthe, native to tropical Brazil, is a member of the Marantaceae Family and is related to the Calathea and Prayer plant. These evergreen perennials are grown primarily for the beauty of their colorful leaves. The three species which make good houseplants are C. lubbersiana, C. oppenheimiana, and C. burle-marxii. C. lubbersiana reaches a height of about 18 inches and has green and yellow patterned elliptical leaves with pale green undersides. C. oppenheimiana also called the ‘Never Never Plant, grows as tall as 3ft., produces lance shaped leaves that are dark green with silver bands, and has foliage with maroon undersides. The Tricolor variety of C.oppenheimiana is even more colorful. C. burle-marxii is a smaller more compact plant that has silver gray elliptical leaves with green stripes. A Ctenanthe is not an easy care plant and can be quite frustrating for a novice plant grower. LIGHTING REQUIREMENTS: Ctenanthes like bright indirect light. If there is insufficient light, new leaves appear solid green rather than patterned with attractive colors. If there is too much light, the colors in the leaves fade. CARE INSTRUCTIONS WATER: Keep the soil evenly moist but never soggy. Ctenanthes do not like to dry out, and do not like cold or hard water. FERTILIZER: Fertilize monthly in the spring and summer using the plant food at 1/2 the recommended strength. Fertilize every other month in the fall and winter. Never feed a Ctenanthe immediately after repotting; wait for at least 6 weeks. TEMPERATURE: Ctenanthes like warm consistent temperatures and will not tolerate temperatures below 60 degrees (15C). HUMIDITY: High humidity is very important for these plants. If the air is dry, place your Ctenanthe on a pebble tray filled with water. Be sure the plant is sitting on the pebbles and not in the water. FLOWERING: The white or yellow flowers are small and inconsequential in comparison to the beautiful leaves. They have 3 sepals, 3 petals, and form a short funnel. PEST: Sspider mite and mealy bug are the pests to look out for. DISEASES: Botrytis, a fungal disease, can occur because of the high humidity these plants require. SOIL: Use a good all purpose potting mix that drains well but still retains moisture. This tiny leafed plant, native to Japan, Vietnam, and China, is an excellent table plant, hanging plant, or climbing plant. Since the fast growing vines of a Creeping Fig easily cling to just about anything, it’s also a great plant for topiaries. The small (1”-2”), thin, delicate, heart- shaped leaves grow on wiry stems. As the plant matures, it develops a dense dark green mat-like look. The beautiful variegated varieties of the Creeping Fig are more difficult to locate than the solid green type but well worth the effort. LIGHTING REQUIREMENTS: A Creeping Fig needs indirect light from an east or west-facing window. Those with variegated leaves require even more light. These plants do surprisingly well in strong artificial light. CARE INSTRUCTIONS WATER: Keep the soil moist but never soggy. A Creeping Fig deteriorates if allowed to repeatedly dry out. FERTILIZER: Fertilize a Creeping Fig monthly in the spring, summer, and fall with a basic houseplant food at 1/2 the recommended strength. During fall and winter, fertilize every other month. TEMPERATURE: A Creeping Fig does well in temperatures between 55-75 degrees. 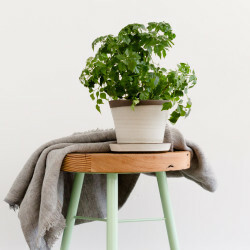 HUMIDITY: This plant likes plenty of humidity, Placing it on a pebble tray filled with water (do not allow the plant to sit in the water) increases the humidity. PESTS: Creeping Figs attract Mealy Bugs, scale, white fly, and spider mites. SOIL: Use a highly organic peat-based soil that drains quickly. Croton were originally an outdoor decorative plant and have only become a popular indoor plant within the last 15-20 years. They have beautiful multicolored hard leathery leaves that come in red, yellow, green, orange, and black. The leaf shapes can be long and narrow, or wide and elliptical. These leaves and entire croton branches can be used in flower arrangements. Croton leaves easily root and can then be added to dish gardens. This plant is a little temperamental and not as forgiving as some others, but the lovely color it provides is well worth the effort. LIGHTING REQUIREMENTS: Crotons need bright light to keep their multicolored leaves looking their best. The new leaves will be green not predominantly yellow, red, or orange, if there is insufficient light. Too much direct sun causes phototoridation a condition that makes the leaves gray and dull looking. CARE INSTRUCTIONS WATER: Allow the top 25-30% of the soil to dry out before watering. Crunchy leaves indicate over-watering. Leaves become soft and droop when the plant needs water. If the plant is severely over- or under-watered leaves fall off. FERTILIZER: Fertilize monthly in the spring and fall and every two weeks in the summer with a basic houseplant food at 1/2 the recommended strength. If your Croton is in a bright sunny spot, but the new leaves are coming in green, cut back on your plant food. Over-fertilizing also causes the leaves of a Croton to curl under. TEMPERATURE: Household temperatures, 60-80 degrees, are fine. HUMIDITY: Crotons will do best in high humidity. FLOWERING: The flowers are small and inconsequential. Remove them as soon as they appear so they don't drain the plant's energy. PESTS: Crotons are susceptible to Mealy Bugs, scale, and Fungus Gnats but it is spider mites that do the most damage. Because a Croton has mult-colored leaves, it is often difficult to see the spider mites. Thoroughly spraying the plant with the green solution once a month is a good preventative measure. DISEASES: Fungal and bacteria infections occur because of the humid environment and moist soil Crotons need in order to grow. SOIL: Use a rich potting soil that drains well but is not so loose that it does not retain water. A Coleus Plant is a fast- growing, hanging houseplant that comes in over 100 different leaf colors, textures, shapes, & designs. A Coleus Plant was very popular during the Victorian era but fell out of favor for a while because of the poor plant quality being sold. Today, a Coleus Plant is once again very popular both as an indoor house plant and as an outdoor plant. The colors on Coleus Plant leaves may be a mixture of lavender, cream, pink, maroon, yellow, red, bronze, and various shades of green. 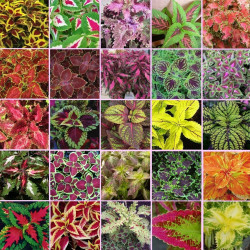 The color patterns on the Coleus Plant leaves can be marbled, striped, or dappled. If you have a very bright area in your home that calls for a hanging plant, then a Coleus Plant is perfect for you. LIGHTING REQUIREMENTS: Very bright light is a must for a Coleus Plant. Coleus Plants can even gradually get used to a few hours of direct sunlight. Florescent grow lights help make the foliage leaf color of a Coleus Plant even more spectacular. CARE INSTRUCTIONS WATER: A Coleus Plant is a fast growing houseplant and dries out more quickly than many other indoor plants. Allow the top inch or two of soil in a Coleus Plant to dry out before watering. Frequent wilting due to under-watering causes the leaves of a Coleus Plant to develop crispy edges, dull colors, and brown spots. Over-watering a Coleus Plant results in root rot. FERTILIZER: The best fertilizer for a Coleus Plant is fish emulsion. If fish emulsion is not available, feed a Coleus Plant monthly with a basic balanced plant food at 1/2 the recommended strength. TEMPERATURE: A Coleus Plant likes warm temperatures between 70-85 degrees though it can survive in temperatures as low as 55 degrees. HUMIDITY: Coleus Plants plant like high humidity. FLOWERING: Pinch the small flowers off of a Coleus Plant as soon as they appear to encourage the beautiful leaves to grow. PESTS: Mealy Bugs, Aphids, and whitefly are plant pests attracted to a Coleus Plant. Check your Coleus Plant weekly so these pests don’t get a foothold on too many of the vibrant colored leaves. Washing a Coleus Plant frequently with warm water helps keep insects away. DISEASES: Because a Coleus Plant likes high humidity, powdery mildew can be a plant disease problem. SOIL: Use a quick draining well-aerated potting soil for a Coleus Plant. Add sand or perlite if the soil is too heavy. 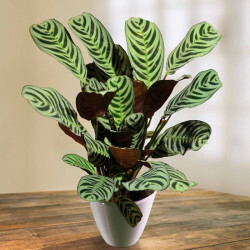 Dieffenbachia Compacta House Plants, or Dumb Cane Plants, are relatively easy-care houseplants with large, broad, oblong, green and cream colored leaves. 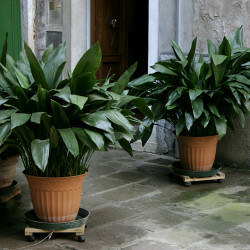 Dieffenbachia HousePlants can be small table plants or 5-6ft. trees depending on the variety you select. Dieffenbachia HousePlants are fast growers that tend to get top heavy if not properly pruned. Dieffenbachia HousePlants are very poisonous. All parts of a Dieffenbachia contain calcium oxalate, a chemical that irritates the skin. If ingested, the sap of Dieffenbachia HousePlants may cause throat swelling and could paralyze the vocal cords. Dieffenbachias earned the nick-name “dumb cane” because the sap of the plant is so toxic it can cause a temporary inability to speak. Be sure to keep these poisonous houseplants out of the reach of small pets and children. LIGHTING REQUIREMENTS: Dieffenbachia HousePlants require medium to high light. Direct sun burns the leaves of Dieffenbachia Plants. Too much bright light causes the vibrant leaf color of Dieffenbachia HousePlants to fade. When an indoor Dieffenbachia Plant does not get enough light, the new leaves are small and far apart on the stem. CARE INSTRUCTIONS WATER: Water Dieffenbachia HousePlants well and then allow the top 2"-3" of soil to dry out before watering again. Dieffenbachia Plants do best when watered on a regular schedule. FERTILIZER: Fertilize Dieffenbachia HousePlants only when the plant is actively producing new leaves. Most Dieffenbachia Plants should be fed every two weeks in the summer and once a month in the spring and fall. Never feed Dieffenbachia HousePlants in the winter. Excess plant food causes browning around the edges of the leaves of Dieffenbachia HousePlants. TEMPERATURE: Dieffenbachia Plants prefer temperatures above 60 degrees. The lower leaves of a Dieffenbachia HousePlant turn yellow when exposed to cold drafts from doors, windows, or air conditioners. HUMIDITY: A Dieffenbachia Plant prefers high humidity but does well in basic household humidity. FLOWERING: Dieffenbachia Houseplants develop rather non-descript spath-like flowers. I recommend cutting Dieffenbachia Plant flowers off as soon as they appear since they slow down leaf development. PESTS: The main plant pests to look out for on Dieffenbachia HousePlants are spider mites and Mealy Bugs. DISEASES: Humidity loving Dieffenbachia Plants are subject to Bacterial Leaf Spot Disease, Erwinia Blight, and other bacterial diseases. SOIL: The best soil for Dieffenbachia Houseplants is a rich organic mixture that drains quickly. The Dracaena family makes up an important group of plants used to decorate, scrub the air and make "green" homes, offices, malls, apartments and the landscape around the world. This group of diverse shaped plants consist of approximately 40 or so assorted species coming in a varieties of forms and sizes. You can find Dracaena in sizes anywhere from 4 inch pots to towering specimen. LIGHTING REQUIREMENTS: Dracaena houseplants will grow slowly in low light but grow faster in medium light. If the light is extremely low, new leaves on the plant will be smaller and narrower in size. Placing Dracaena houseplants in the direct sun, even for a few minutes, burns the leaves. CARE INSTRUCTIONS WATER: When in doubt, do not water Dracaena houseplants. Allow the top 50% of the soil to dry out before watering. The lower the light, the less often Dracaena plants need water. Fluoride, chlorine, and salt in the water cause brown tips and yellow spots on the leaves of Dracaenas. FERTILIZER: Dracaena Plants do not need very much plant food. Feed a Dracaenas once or twice a year in the spring and summer with a basic houseplant food at 1/2 the recommended strength. Too much fertilizer causes leaf tip burn on Dracaena Plants. TEMPERATURE: Dracaena plants do not do well in temperatures below 55 degrees. Cold winter drafts and blowing heaters damage the leaves of Dracaena Plants. HUMIDITY: Basic household humidity is sufficient for a Dracaena. FLOWERING: If the growing conditions are right, a Dracaena plant may produce a 10"-12" stalk with a large fragrant white flower. Although this is fun to see, the flower often slows down leaf production, alters the shape of the plant, and may secrete a messy sticky sap that get all over the plant. I recommend cutting off the flower as soon as it starts to grow. PESTS: Plant pests such as Mealy Bugs and scale can be a problem for Dracaena plants. Spray the plant with the green solution and then carefully wipe the leaves. This removes dust buildup as well as the plant pests. DISEASES: Leaf Spot is the main Dracaena plant disease. SOIL: Dracaena plants need a loose soil that drains quickly. In Hawaii, Dracaenas are often grown in lava rock. English Ivy Plants, native to North America, Europe, and Asia, can be found in over 100 different sizes, colors, and leaf shapes. Whether you want a plant to place on a table, hang from the ceiling, sit in a wall sconce, or train as a topiary, there is an English Ivy plant for you. Some of our favorites are: California Ivy, Asterick Ivy, Kolibri Ivy, Algerian Ivy, Gold Child Ivy, and Needlepoint Ivy. NASA has determined that English Ivy Plants are excellent Clean Air Plants and can absorb air-born toxins such as formaldehyde, carbon monoxide, and especially benzene. The beautiful English Ivy Plant with long flexible stems is highly poisonous, so be careful to keep it away from young children and pets. LIGHTING REQUIREMENTS: English Ivy Plants like bright indirect light but direct sun burns their leaves. In low light, the new leaves of an English Ivy Plant are smaller and further apart. CARE INSTRUCTIONS WATER: Most English Ivy Plants die because they are over-watered. Allow the top 25-30% of the soil in an English Ivy Plant to dry out before watering. Crispy leaves on an English Ivy Plant indicate over-watering not under-watering. FERTILIZER: Feed an English Ivy Plant every two weeks in the spring and summer with a basic houseplant food at 1/2 the recommended strength. Fertilize an English Ivy plant monthly in the fall and winter. Never use fertilizer on an English Ivy Plant when the temperature is extremely hot or cold, if the soil is very dry, or if the Ivy Plant is not producing new leaves. TEMPERATURE: English Ivy Plants grow in temperatures between 45-80 degrees, but they do prefer a consistent temperature. HUMIDITY: English Ivy plants like medium to high humidity. PESTS: English Ivy Plants are susceptible to the following plant pests: spider mites, scale, Mealy Bugs, Aphids, and white flies. To keep plant pests off of an English Ivy Plant, spray once a month with the green solution. DISEASES: Fungal and bacterial leaf spot are the main plant diseases affecting an English Ivy Plant. SOIL: Use well-drained, rich, organic soil that retains water for an English ivy Plant.